As Andrew and I search for teaching work in Madrid, I can’t help thinking back to our first experience of teaching abroad in Hanoi. I’m hoping the lessons I learned from those exciting, turbulent months in Vietnam’s crazy capital city will help me cope with the challenge of starting afresh in Spain. Are you thinking of looking for jobs in Vietnam? 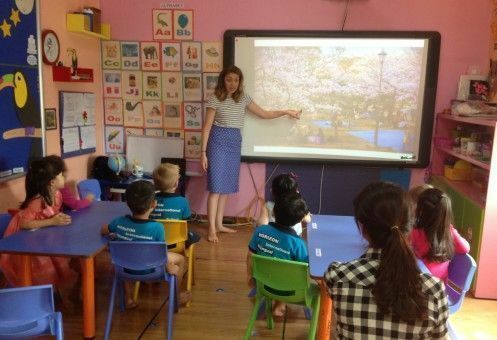 Asia is a great place to cut your teeth as an English teacher; in this post I talk to British couple Hannah and Ben about their experiences of teaching at a language centre and an international school in Hanoi. 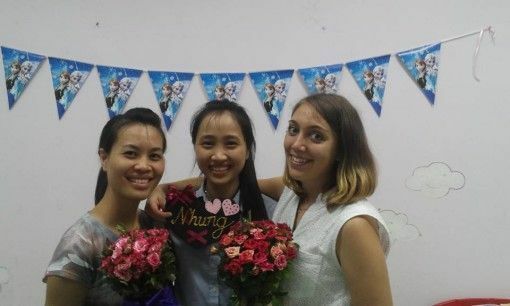 Did you miss the first two Q&As with teachers in Vietnam? You can read part one and part two here. Hi! I’m Hannah, a 26-year-old Brit from rural Worcestershire, England. 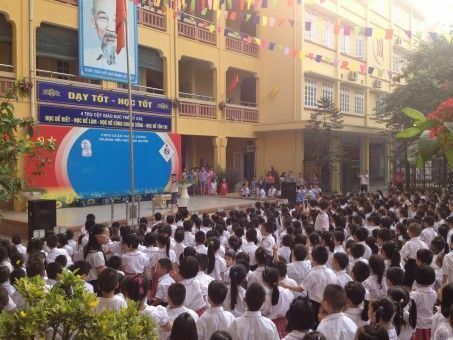 I currently live in Hanoi and I’ve been teaching in an international school here for 14 months. I travelled around South East Asia for a few months in 2014 and really enjoyed my time in Vietnam, especially its capital Hanoi. In the city there is a huge sense of cultural identity most noticeable in the architecture, the food and the quirks of daily life on the street. As a working destination Hanoi offers high teaching salaries and a low cost of living; making it a great place to save. Did you have any teaching qualifications or experience before arriving in Vietnam? Before leaving the UK I did a TEFL course; one weekend of taught material and 120hrs of online coursework. 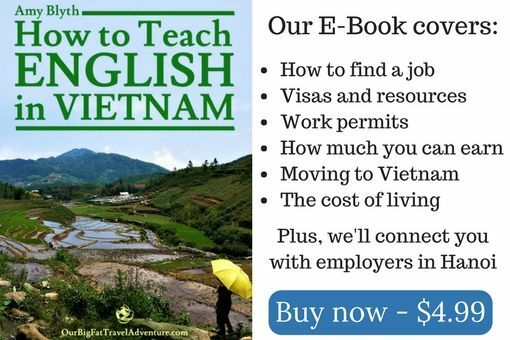 This really helped me to get my foot in the door with prospective employers in Hanoi, and as a non-teacher, gave me some valuable experience in preparing lesson plans. I work for a private international school and found the post by emailing my CV to as many language centres and international schools as I could find online. Many employers take on new staff even when they aren’t advertising posts, so it’s worth tracking down contact details for places that aren’t listed on jobsites. I only started looking for jobs after I had arrived in Hanoi as I didn’t want to risk accepting a job before seeing the teaching environment and meeting the staff. I work as a Kindergarten homeroom teacher in an international private school. My post is unlike many EFL jobs in Hanoi as I teach students from Vietnam, Iraq, Belgium, Nigeria, Turkey and Japan. I have five classes each day- covering English, maths, science and creative activities. I love my job as I’ve had the opportunity to really get to know each of my students; having a small class means I’m able to arrange fieldtrips, outdoor activities, cooking tasks and more. I am very lucky to have my own classroom, just eight students, two classroom assistants and access to great resources. I teach just over 3hrs per day (15hrs+/week) Monday to Friday, although I am required to be at school from 8am-4.30pm each day. This means I have time to complete my planning during school hours and don’t have to spend my weekends prepping. As a homeroom teacher my job also requires behaviour management, weekly reports and occasional weekend working for special school functions. 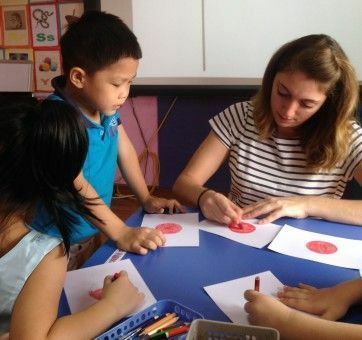 If you’re working a 15hr week at a language centre you can expect to earn around $1,200USD per month, international schools pay much better but have some obvious drawbacks. Although my hourly teaching rate is higher, I also have lots of unpaid non-teaching hours when I am still required to be at school to deal with behavioural issues and attend meetings. For me getting a work permit was a very laborious and expensive process that took almost 11 months! Before I received my papers I had to leave the country every three months to get a new visa. It is worth mentioning that Vietnam’s visa requirements change ALL OF THE TIME. If you’re looking for a hassle free experience I would consider applying for a job with an employer who supports the work permit application process. Anyone who has ever taught will tell you that there are highs and lows. For me, teaching in Hanoi has been an overwhelmingly positive experience but I have had days when I’ve come home and screamed into a pillow! Kindergarten teaching is energetic, demanding work, but the rewards are tenfold. Kids at this age can make such huge progress with language acquisition that even short-term posts can be very rewarding. Most expats in Hanoi ride motorbikes, but I’ve managed for a year just using conventional taxis and ‘grab’ (a private car service with mobile booking app). The buses here are also abundant and reliable if you can figure out which one to board. I am fortunate enough to live within walking distance of my school so travel hasn’t been a big hassle for me. I live in Tay Ho district with my boyfriend Ben. This area is full of expats and has all the comforts of home; bakeries, Western restaurants and imported food items. We chose a modern two-bedroom apartment, which costs us $600 per month. This includes water and cleaning (linen changed once per week, apartment cleaned twice per week). Ben and I keep a strict budget that helps us to save $1,800 each month. Our living costs (excluding our rent) are around $615 per month. This includes electricity ($65), groceries ($160), travel ($110), and socialising, including eating out ($280). We find it easy to stick to this budget and still go out a few times each week. The best thing about living in Hanoi is the people! Vietnamese people are both generous and genuine; they’ll do absolutely anything to help you out. I’ve been invited to family dinners, weddings and special celebrations more times than I can count and I’ve made friends I hope to keep for life. The worst thing about Vietnam is the air pollution, which frequently gives me blocked sinuses and headaches. Teaching English in Vietnam is for flexible and patient people. It’s a great place but it’s not always easy to get things done. If you spend your days forcing your Western ideas on everybody you won’t have a good time, just take a step back and enjoy the Asian perspective. Hello! My name is Ben, I’m 24 and I’m from Surrey, England. 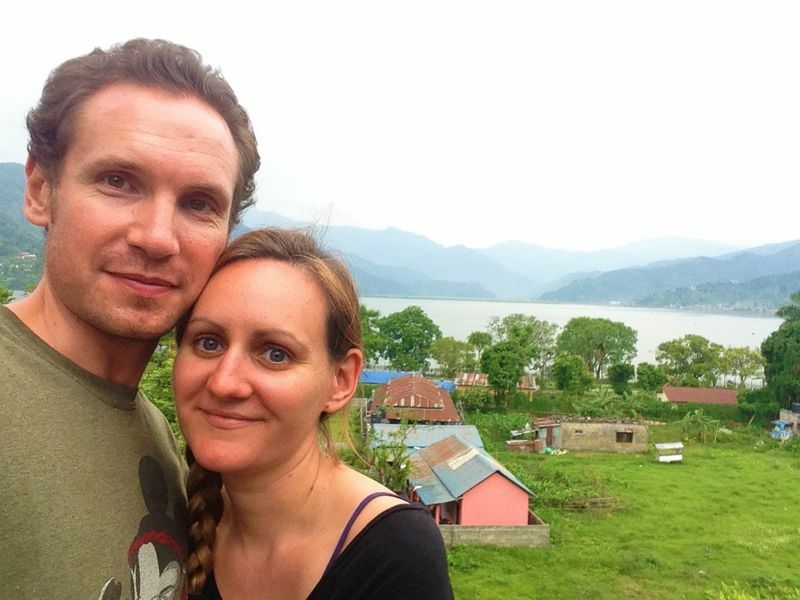 I have been teaching in Vietnam for just over one year with my girlfriend Hannah. I had just finished University and felt like it was the perfect opportunity to see more of the world before I decided to settle down into a 9-5 job and the daily grind. The reason I chose Hanoi was because I first visited the city in 2014 and was fascinated by the city’s uniqueness. This spurred me on to come back in 2015 and try teaching as a way to prolong my travels and learn more about Vietnam. 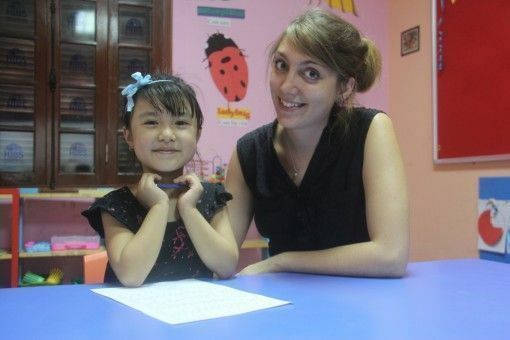 I had a 120 hour TEFL certificate and my Journalism degree. I currently work for a language centre in Hai Ba Trung district. Finding this job however was surprisingly difficult. We arrived in January just before Tet (Vietnamese New Year) and this meant that nowhere was hiring. We ended up trawling the internet and emailing as many places as we could find. After a couple of days of waiting, the language centre that I work for got back to me and offered me an interview. I would recommend looking on a Facebook group such as Hanoi Massive, where there are always teaching jobs being advertised. I work in a Vietnamese public school and teach children aged 6-10. My lessons are 35 minutes long and have an average of around 50-60 students per class. The lessons are fast paced and energetic and focus solely on spoken English which means a lot of games as well as singing and dancing. I teach both in the daytime and in the evening. At the public schools the day is split into morning and afternoon sessions with the morning between 8-11am. The afternoon session is from 2pm-4.45pm. I also teach some classes at my language centre that start at 17.45pm and last for 90 minutes. In an average week I work around 18-19 hours. Dealing with work permits and visas has been a particularly long and drawn out process. Due to the constantly changing rules and regulations, knowing exactly what is the “right” way to get things done can be fairly time and money consuming. 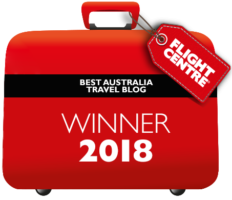 In this regard, working for a larger organisation or company definitely has its benefits as the process for getting the right visa is fairly streamlined. In my experience however, the process involved numerous visits to the British Embassy and a number of visa runs to Bangkok before I had the right paperwork. Overall the teaching experience has been a positive one. Students are always enthusiastic and happy when I walk into their classrooms which is a nice feeling. On the downside, the large classes can be exhausting to teach and controlling over 50 students can be tricky sometimes. I use either regular taxis or motorbike taxis to get around. I don’t trust myself on a moped! We live in Tay Ho district. This district is known for being the expat district so prices can be a little more expensive than other neighbouring districts. We pay $600 a month in rent for a two-bedroom apartment. We aim to save around £10,000 by the time we finish. As a couple it’s possible to save upwards of £1,100 a month. In my opinion, Hanoi has a large number of redeeming qualities. The main one is that the city hasn’t lost its sense of cultural identity as much as some other big cities in the region, making it an interesting place to explore. Also, living in Hanoi is very affordable. Even on a low to average teaching salary you can still afford to eat out numerous times a week and do fun stuff at the weekends. The beer is also some of the cheapest in Asia! The worst thing about living in Vietnam is the noise and chaos. Some days it is impossible to escape the constant beeping of horns and the traffic can make it difficult to get around easily. There is also a certain pace to Hanoi living with things taking a long time to get done unless you know the “right people” or have some “under the table” money on hand to speed up the process. Research, research, research. Join facebook groups such as Hanoi Massive or Hanoi Foodies and ask questions. Moving to Hanoi is not a decision that should be taken lightly but I thoroughly recommend it. Also, make sure you look up the currency before you arrive, with notes from 500 dong to 500,000 dong paying for things is always interesting. 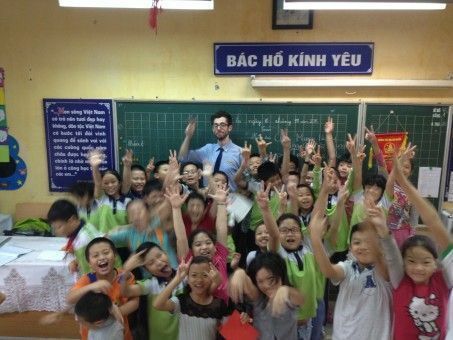 Sounds like teaching English in Hanoi is a very good way of saving money and having good quality of life, the wages are good and cost of living so cheap. Hanoi looks like a very interesting place and the gateway to other great places to visit in Vietnam. Can’t go wrong with that. Yep, it is great, sometimes I wonder why we left! Then I remember the chaos and pollution; you’ve got to take the bad with the good I suppose and every place has its pros and cons.